1. Who did you really connect with this month? Ahsatan, this is not her real name, but a play on it instead. Connecting with her caught me off guard but was so lovely. We went out for lunch and chatted after a few different classes. It was nice to do something with another woman. It’s not something I do often and I miss chatting with women who are different and yet have a lot of the same goals and ideals as I do. Nikki, is her real name. We have some exciting things planned in the future and I’m pretty excited about it. 2. What new ideas have been tugging at your sleeve? I have this vision for a mug and I know what I want and I want to make it happen, however it isn’t working. At least not yet. Pottery is hard and I’ll get there eventually. You can however, see some of what I have made in this post. Honestly my creativity has been at an all time low. It’s been a long time since I’ve not had a line up of posts for the blog, but this month I tapped out. I am blaming it on this inbetween stage, not winter snow anymore but not spring blossoms either. This past Monday was the first time I haven’t had a post up since December 2017. I want to feel guilty about it, but honestly I can’t. I have no plans for what to write about in April and it’ll be weird to not stress about that. If something comes to me, I’ll write about it but otherwise, posts will be sporadic for a while, I think. 3. What made you smile in March? Kevin - finding his missing gloves. Boiling the water off while trying to make lunch. Taking pictures with me in all the hotels we stay at. Phantom of the Opera - while I think memories of the soundtrack will forever be my favorite of this, seeing it live was pretty damn amazing. Pottery - specifically the mug I made and need to mail to my bestie. Lyra… Aerial Yoga… Sling Class… Jess’s private class… and other things I am for sure forgetting. These pictures I randomly took for this post. They turned out exactly how I wanted them. Real life laundry moments. I am annoyed that the bad guy from the first book did not end in this book. It seems like just an opportunity to drag out a story for no other reason than book sales. It would have been much better served in having that particular story line finished and carried onto a new intrigue. There are still many issues I take with this book (again with the fascination with slavery and almost worse in this one, because she herself sold into slavery thinks that the way her country does it is better than other countries, even though it’s still slavery… gah). I neither liked it more or less than the first book. Which is what made me not want to continue with the series. Contemporary fiction is not something I read. It hits far too close to home normal and I love take me away feelings fantasy brings me. However this one sounded good and I thought to give it a try. It was good. There is one scene, an adult scene between Wei and Lina where I really appreciated how it was written and whose perspective it was from. Though it bothered me so much that there was no talking between the two of them. The scene between Linda and Qiang also was really good but I hate that it takes being trapped for words to be fully shared. This was a really good book and if you enjoy contemporary fiction, I would highly recommend it. I have bought ever single one of Amanda Lovelaces poetry books. The first two in this series both inspired blog posts - the princess saves herself in this one and goodbye 2018. This one might too. I don’t know yet. But I do know it didn’t hit me quite was much as the first time but I still really enjoyed it and I am so happy to have it on my shelf. you are the mermaid whose voice returns. It’s probably not a well known fact unless you’ve been following me for many, many years but I have a thing for anything Jane Austen. It’s not even that I always enjoy her literature, it’s always been about the challenge of reading the old English and actually understanding it. Something that is hard for me sometimes. As such I have a collection of her works and the rip offs of it. Pride will soon be added to that collection. I originally got this through the library but I should have just bought it. It’s good, I enjoyed it and it was satisfying. It was also different and unique and not just a rehash of Austen’s work. Also unlike Austen’s work, I closed the book wanting more. I wanted to know more about Zuri and her college experience. Georgia and her grandmother. 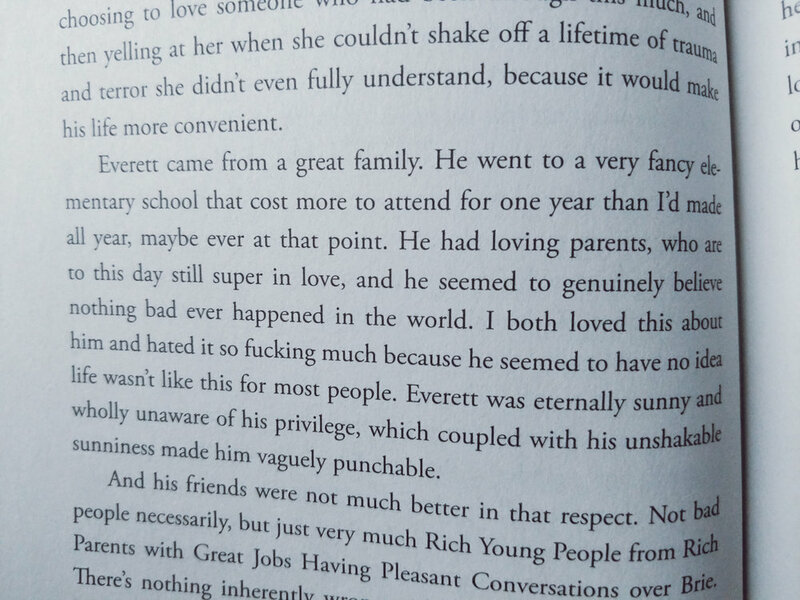 All the parents that were actually present in this book an unusual thing in young adult. It’s good and if your a fan of Austen’s and like new twists on things I highly recommend this one. This collection of essays was brilliantly put together and very well written. I enjoyed every aspect of the book and book to buy it soon. I highly recommend reading it. I am not sure what caused me to pick up this book or why I thought I would enjoy it, but what I got out of it was definitely not what I expected. 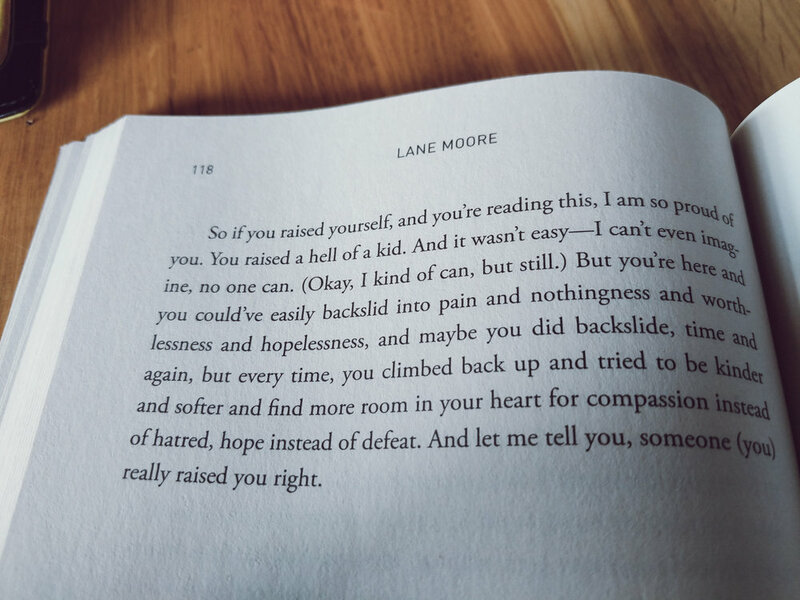 Lane Moore is a stand-up comedian and she does a great job of writing about terrible parents with a good dose of humor and I am fine, really. 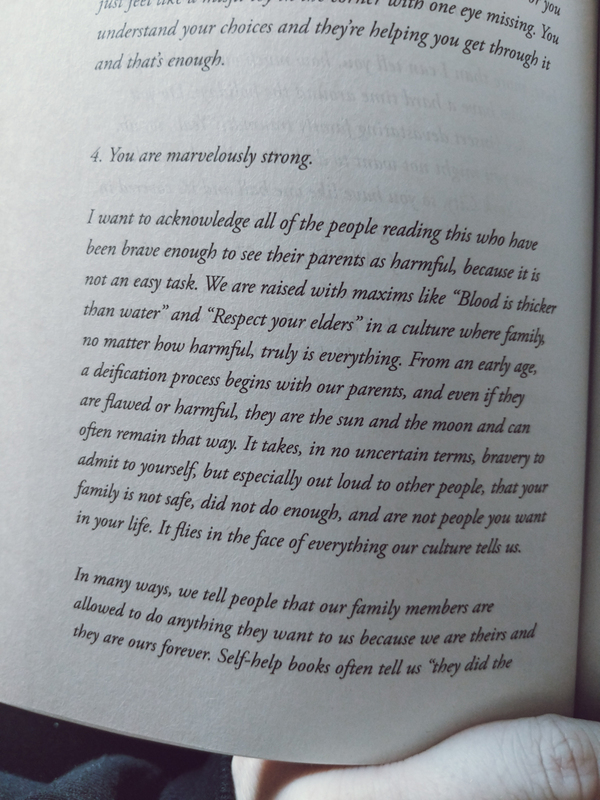 I took tons of pictures of paragraphs that hit me like a ton of bricks. So instead of trying to just share my favorite quote like I normally do. Here are the pictures I took and you can click them to make them bigger to read what caught my attention. Things that I would like to note; ONE - I need to see the movie practical magic. TWO - picture three almost perfectly describes Kevin. THREE - you are free to do what you want with that information.